Here is a soup with silken elegance that makes it appropriate for the first course of a special dinner. Or treat your family to a Sunday night supper of this sherry scented soup, with warm crusty bread and sliced ham or other cold meat. 1. Sauté mushrooms in heated butter in a 3-to-4 quart saucepan until lightly browned. Remove and reserve about 1/3 of the mushrooms. 2. To mushrooms in pan, add onino. Cook until limp and golden. Mix in flour, cooking until bubbly. Add salt, thyme and catsup. Remove from heat. Gradually mix in broth. 3. Cook, stirring, until soup boils gently. Reduce heat. Cover and simmer 15 minutes. WHirl soup, half at a time, in blender until smooth. Return to saucepan. 4. Stir in half-and-half. Heat until soup steams. Beat egg with lemon juice in a small bowl. Stir in small amount of hot soup. Pour egg mixture into remaining soup. 5. 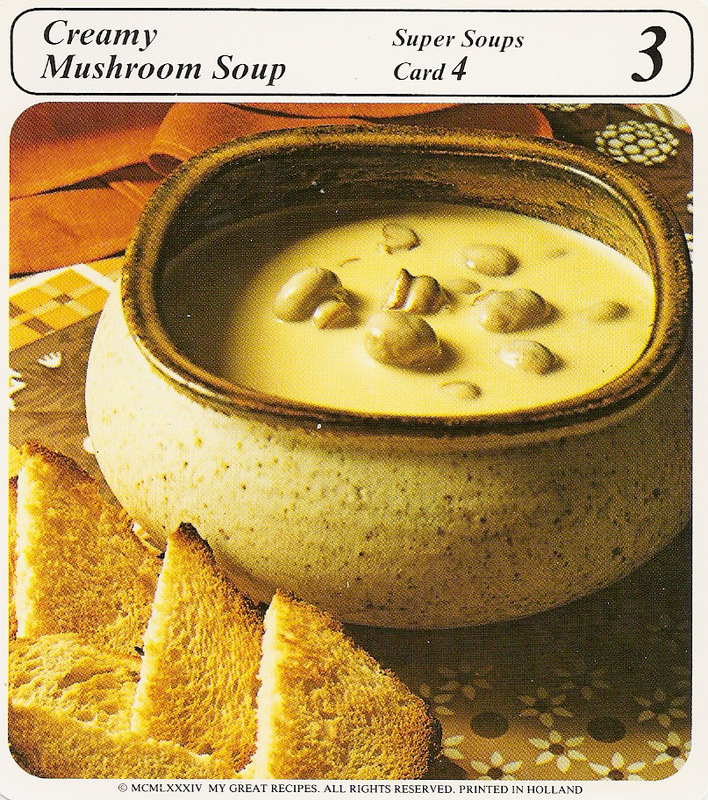 Mix in reserved mushrooms. Cook, stirring, until very hot (do not boil). Mix in sherry. Salt to taste. ©MCMLXXXIV. My Great Recipes. All rights reserved. Printed in Holland.